Join the discussion on our forums! Come discuss Moroes over in our dedicated Moroes discussion topic. Moroes is not only pretty bad in general, but he's super bad when there are so many consecrations, blizzards, and maelstrom portals going around. Also, try not to let how well one card looks in one game against a terrible deck shape how you view it. Try and get a handful of games experience with a card, and try and play against the meta decks if possible to really test something out. I don't even own The Caverns Below, and I'm a free to play player. 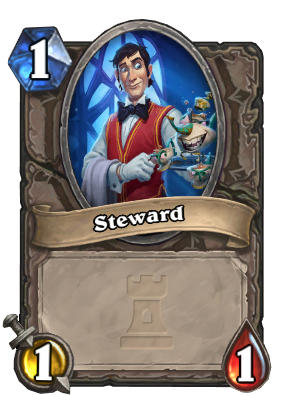 So unless I get lucky before Knights Of The Frozen Throne, this guy's gonna get dusted for me. Don't call yourself free to play, it's silly. Whether you've spent a couple bucks on packs or adventures or not is pretty irrelevant. Doing your quests wisely, dusting the correct cards, and intelligently crafting is what matters. Buying a couple packs at the end of the day isn't too big of a deal. Speaking from experience as someone who plays casually, is "free to play", yet has "all the cards". Anyway, yeah definitely dust him man. The Caverns Below made this card a bit annoying. 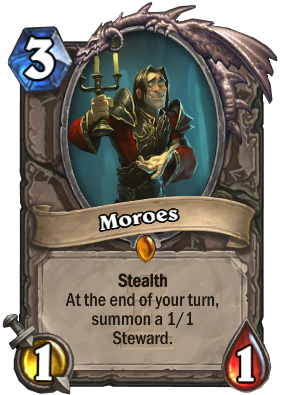 But what if Moroes text was: Stealth, at the end of your turn summon Steward with the same stats as this minion? I mean: if you buff Moroes with Silvermoon Portal, he'd become 3/3, AND each steward he'd summon would be 3/3 as well. Could be a bit problematic to deal with an infinite source of large guys i.e. buffed by Paladin, Priest (hello Divine Spirit + Inner Fire, maybe), even by neutrals like Shattered Sun Cleric or Stormwind Champion, but IMO this version could be much more playable than the present one. Maybe raising its cost not to make this too good. That seems like it'd be too punishing for decks without heavy board wipes. Un'goro changed the communities thoughts on Moroes from the looks of it, the people who dusted it must be regretting it today. The only deck I see it used in is Quest rogue. But yeah, I just disenchanted it. Pretty worthless when I need dust. Scrolling through the comments and laughing at every comment about how it's an easy 400 dust. I bet that 27.7% that voted "Dust it!" are now regretting that decision after The Caverns Below came out. Before Un'Goro came out I yelled "Moroes Tier 1" and got downvoted. Who's laughing now?! Moroes + The Caverns Below seems pretty good. You have to play the minion card, not just summon the minion. I'm referring to when the quest is complete and you get Crystal Core. Moroes is then a 5/5 stealth that spawns a 5/5 token at the end of each turn. You, me, and the 27,7% that voted for "Dust it!" probably regrets Disenchanting Moroes now. practically no difference: they both last just 2-3 turns at most and they summon tokens.